Matt Damon is back in action, but this time around he is doing construction and fighting monsters. 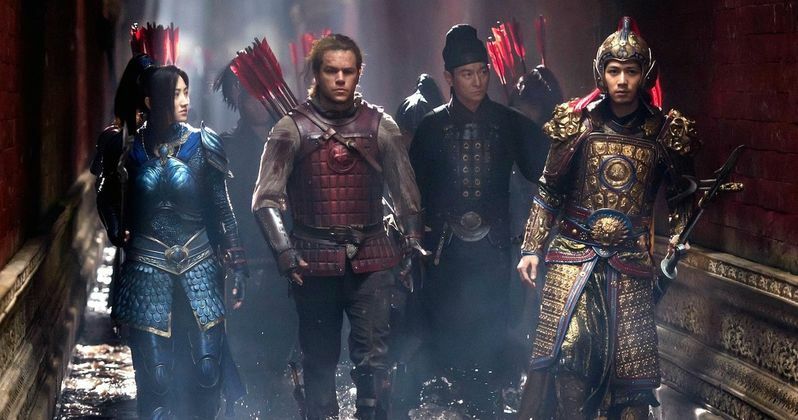 Legendary pictures have just released the latest trailer for their upcoming period action-adventure movie The Great Wall, which is a fictional take on the reasoning for the construction of The Great Wall of China. Given the movie's February release, this is looking like it could be the first big blockbuster of 2017. Legendary Pictures brought a presentation for the movie to New York Comic Con this weekend, and they just so happened to bring a new trailer along with them as well. Luckily they didn't make us wait too long before dropping the trailer online. In The Great Wall, Matt Damon is leading humanity's fight for survival in the movie from Legendary and Universal Pictures. As waves of massive beasts attack the wall, a huge army of elite warriors attempt to confront this seemingly unstoppable force. The Great Wall is not at all an attempt at historical accuracy. Granted, a historically accurate movie about The Great Wall of China would be interesting, but this movie has monsters in it. It is appropriately being helmed by Chinese filmmaker Zhang Yimou, best known for his work on the critically acclaimed Hero and The House of Flying Daggers. The movie centers on the construction of the historical landmark, but poses that it was built to help protect against very scary lizard monsters, who we saw brief glimpses of in the first trailer. There has been some controversy surrounding the movie ever since the first trailer landed online a couple of months ago. Whitewashing has been a sensitive subject in Hollywood as of late, and given that Matt Damon, a white man, was cast in the lead of a movie based in China, many people were not happy about it. Actress Constance Wu and others took to social media to voice their distaste for the choices made in the movie. Director Zhang Yimou has stated that he feels it is the opposite of what people are suggesting, given that it is a high budget movie tackling Chinese culture with a massive Chinese cast. Matt Damon's character is not intended to be Asian in the movie, which does set the situation apart from something like Scarlett Johansson being cast in Ghost in the Shell. The Great Wall stars Matt Damon along with an ensemble cast that includes Willem Dafoe, Pedro Pascal, Tian Jing, Andy Lau, Hanyu Zhang, Eddie Peng, Lu Han, Kenny Lin, Junkai Wang, Zheng Kai, Cheney Chen and Xuan Huang. The movie is set for release on February 17, 2017. Be sure to check out the new trailer for The Great Wall for yourself below. Can The Great Wall Overtake LEGO Batman at the Box Office?